If you’re looking for the best GoPro gimbals and stabilizers for 2018 then you might want to continue reading. Regardless of whether you are a professional photographer or simply a passionate one, you must have heard about GoPro. More than a decade ago, the company brought about a revolution to the photography market (and not just the action camera market) when they first launched their Hero series. Through the years, GoPro has successfully managed to improve, evolve, and completely change the game when it comes to action cameras. 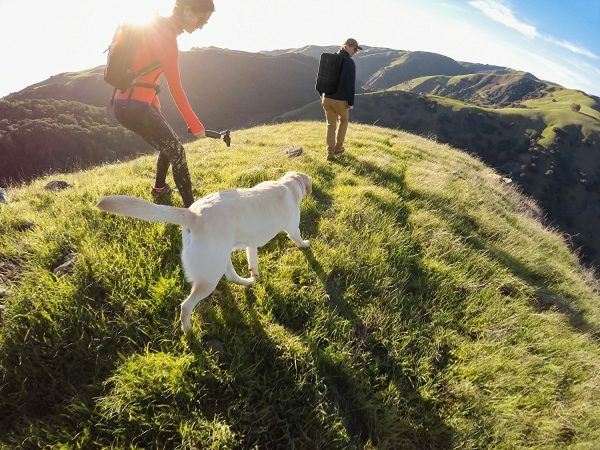 With their products offering high-end specifications, insane resolution, stunning image quality, and amazing video experiences, GoPro has rapidly climbed the ranks to be considered as arguably the best in the market right now. But no camera can offer you a flawless experience. No matter whether you are a pro or an amateur, camera vibrations and shakes can be enough to ruin your captures. Stabilization is one of the key elements in a professional video, and unless you are willing to go the extra distance to achieve that kind of stabilization, you are simply not reaping the best out of your GoPro camera. This is the part where gimbals step in. If you are looking to shoot a shake-free, smooth video, you are going to require a gimbal for your GoPro product. But this is a flourishing industry, and searching for the best GoPro gimbal without any prior research can be extremely frustrating. In fact, the sheer number of gimbals and stabilizers available in the market should be enough to bewilder you, let alone the specifications of each. How to Pick the Best GoPro Gimbal/Stabilizer? If you are not quite certain about which gimbals are the best suited for your camera, it is probably not wise to commit in an investment yet. I have researched out the content for you, and have attempted to lay it all down in a systemic manner in a way that helps to understand and compare the products against one another. Although there are lots of other alternatives that are doing pretty well in the market, I have limited our list to 14 gimbals that are not only the best on paper, but are also trusted by customers from across the world. The question of reliability is also a significant one. If your gimbal breaks in the middle of a recording and smashes your GoPro to the ground, you lose not only the gimbal, but also the camera. It doesn’t require too much brain to figure out that the first thing that you should be looking for in a gimbal is the quality of the products. If you are not focusing on quality, you might end up buying a product that does not neutralize the camera shakes, and if it doesn’t, the whole point of buying a gimbal turns out to be fruitless. Considering the prices of top end cameras these days, losing a GoPro just because of a poor quality gimbal is the worst financial disaster you can bring in upon yourself. Now that I have stated why quality should be your priority, let’s take a look at the next important thing to consider. Battery life may not seem to be a major criterion at the outset, but once you begin working with your gimbal, it’s sure to step in at some point. The average gimbal in the market currently offers around 4 to 5 hours of battery life, which is definitely not the best. The best gimbals offer as much as 12 hours, and even if your gimbal does not match that, make sure it does not score too low on the battery performance either. If you have read some articles regarding GoPro gimbals, you have probably seen the EVO GP-PRO gimbal mentioned at the top in every one of those articles. 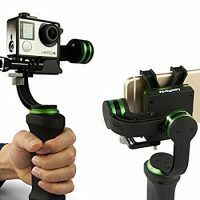 It is not without reason that this product from EVO Gimbals is touted to the best among all in the market currently. It is packed with features, and offer an amazing experience for recording extra smooth videos that can be regarded as art. It is primarily designed for the Hero series of cameras, and works perfectly with Hero 3, Hero 4, Hero 5 Black and Hero 6 Black. The EVO GP-PRO features a 4-way thumb-stick that permits you to have absolute authority over the gimbal’s pan, tilt and roll axes. If you want flexibility and control, this is the gimbal you must go for. Not only does it adjust to your shooting requirements, but also lets you get unique angles on your subject without too much work. A stabilization accuracy of ±0.01 degree further helps in this regard. You can now bid farewell to shaky videos and vibrations that otherwise ruin your captures. This gimbal comes with a 3.5 mm AV audio/video output port that can be connected to an external monitor, thereby allowing you to get a better feel of the smooth cinematic quality of your video. A built-in charging cable helps in extending the battery life of your GoPro. All the basic shooting modes are present, which makes it a versatile gimbal designed for one and all. It comes with a one year warranty period; so you can be sure of its reliability and performance. It’s highly recommended by experts as well as customers. The GoPro Karma Grip is as best as you can get when it comes to brand value and trust. It is the official gimbal launched by GoPro, and thus, is designed exclusively for GoPro Hero5 Black and Hero6 Black, it can also be used for Hero4 silver and Hero4 Black but needs a separate harness. If you are too reluctant about buying third party gimbals for your precious GoPro camera, this is the one for you. Of course, the quality is good enough, as can be expected from a company like that. One of the very first things that strike you when you un-box the GoPro Karma Grip is the ergonomic design that fits perfectly in the hand and gives a nice, comfortable feeling. The stabilization capability is better than most other gimbals in the market; so you get a smooth recording without much hassle. It is small and compact, easy to carry around with you, versatile and ridiculously easy to use. All you need to do in order to power up both your gimbal and your camera is press a single button. You can even insert highlight points straight from the gimbal itself. You cannot change batteries on the go, and that might seem as a problem if you travel a lot and don’t have access to a power outlet at all times. Removu is one of the main brands in manufacturing gimbals. If you’re looking for stable professionals shots then this gimbal is for you. It has a 3-axis stabilizer with high quality motors and rotary sensors to give you the smoothest shots while using your GoPro for any shaky activity like snowboarding or skiing. The S1 is equipped with a detachable wireless remote control that you can use to control the angle and change modes easily while doing your favorite sport. Not only that, the S1 and its motors are designed to be water-resistant so you don’t have to worry about a splash of water coming your way, you’re covered! Another thing I loved about this gimbal is the ability to detach the handle from the body allowing you to attach it on any GoPro compatible mount. The Removu S1 is compatible with Hero3/3+/4/session/5/6 which is a big advantage if you own different GoPro models and would like to use them with the same gimbal instead of buying different gimbals for different GoPro. For anyone looking to shoot professional videos, the Lanparte HHG-01 gimbal is a good product to begin with. It has a rubberized design that helps in gripping it better, and makes mounting on platforms easier and more convenient. It is designed to fit most of the GoPro cameras. You can operate the three switchable functions – following, semi-following, and locking – with a single press of a button. It is a handheld gimbal that comes with a 4.9’ detachable cable and a built-in power port. It operates at a voltage of 6.5 to 12.6 V and a standard 120 mA current. The gimbal allows you to control most of the functions in such a way so as to record a smooth, professional looking video with exceptional stability. The advanced brushless gimbal motors further help in stabilizing the camera functions. There’s a standard ¼-20 standard threaded hole at the bottom of the grip ensuring compatibility with a large variety of devices. At 345 grams, this product is lightweight, thanks to the aluminum that makes it sturdy, without adding to extra bulk. It’s quite cheaper than the previously mentioned gimbals, and can be a great buy for you, if you are on a budget. If you own a GoPro Hero 5, you are probably aware of the fact that your choices are limited in the gimbals category. The Karma Grip is one of the best gimbals to consider if you are going after reliability and performance, but it does have its own set of cons. It’s slightly expensive, has a non-removable battery and the battery performance isn’t too impressive either. This is where the GeiyuTech G5 takes the upper hand. It features a removable battery, joystick function, and is affordable. The build quality is especially nice, and given the fact that it is built uniquely with the GoPro Hero 5 Black and Hero 6 in mind, it provides the exact counterweight with the camera. That said, it is compatible with the Hero 4 version, as well as other cameras of similar sizes. Installation is a hassle-free experience when it comes to this product. You can power it on and off with the help of a single button, which also lets you switch between different modes. The 4-way joystick serves the purpose of adjusting camera angles to precise position, and seems to be a good fit with the Hero 5 voice control feature. The gimbal gives 8 hours of battery life, which is better than the average at all costs. It is splash-proof, and has integrated gimbal and camera controls. Plug and Play, No Software Configuration, No Tuning, No Balancing! One thing you should be aware by now is that EVO Gimbals products do not come in cheap. However, what make them worth every dollar are the quality and the reliability they provide. The EVO SS 3 Axis Wearable Gimbal stays true to its name and emerges as one of the best solutions for POV shooting when it comes to gimbals in action sports. It has the same stabilization accuracy as the other EVO gimbal, and therefore, offers the same professional looking smooth quality video as the other one. You can change the stabilization modes with a simple click of a button. What’s more is that the gimbal permits you to adjust the tilt angle of your action camera according to your needs. You simply have to hold the camera in the position you want it to be until the controller records it automatically and holds the angle. The camera offers a tilt axis range from -90 degrees to +180 degrees and a pan axis range from -160 degrees to +160 degrees. The turnback mode can rotate the camera backwards and allows you to record the video behind you. This is actually useful while capturing footage with the camera mounted on your helmet. Setting up the EVO SS gimbal is not a difficult task. In fact, it’s ready to use right from the moment of unboxing. It has a 3.5 mm AV audio/video output port which you may use with an external monitor. It also comes with a standard ¼-20” female thread at the bottom. The battery performance isn’t the best as compared to its competitors in the market, but the fact that the mounting tray allows you to add the GoPro LCD BacPac and battery somehow makes up for that drawback. The company is so confident about this gimbal that they have placed it under a 1 year USA Parts and Labor Warranty. The Zhiyun Evolution gimbal stands out in the fact that it provides as many as 12 hours of battery life, courtesy its dual batteries. Further, it is interesting to note that it can even power the attached camera. No wonder, so many people believe this handheld gimbal to be the best companion for their GoPro cameras. It’s compatible with all GoPro models. The design is lightweight, but strong. The aluminum body has enough in it to resist any kind of damage while ensuring that the gimbal does not get to bulky. It comes with a 5-way stepless joystick that allows you to toggle between different modes. It is possible to watch your images in real time by connecting the 3.5 mm video output to an external monitor, if you want. The Evolution may not be the best on specifications relative to the others in this list, but it surely makes its mark with its power efficiency, over charging protection, and short circuit protection. If you are vulnerable to damaging your products due to power disturbances, the Evolution is probably the only one you should be looking at. The Zhiyun Smooth 3 is the perfect gimbal to be used for your GoPro Hero 3/4/5/6 cameras as well as iPhone, Samsung and Nexus mobile phones. It can handle the weight of your device without any issues, it takes up to 260g (0.57lb) of weight which is more than enough. You can control most of the settings using the handgrip’s thumbwheel and joystick like real-time focus, exposure, ISO, white balance and shutter speed adjustments. Like its name says, it delivers smooth, steady and noiseless videos using its 3 brushless motors and 3-axis 360 degrees unlimited rotation. It’s lightweight so you don’t have to worry about using it for a long period of time, thanks to the high quality aluminium used to manufacture it that also make it more robust. The 2-way clamp can be easily switched from horizontal to vertical depending on the device you will be using with this Zhiyun Smooth 3. Another great feature is the ability to recharge your GoPro or smartphone while in use! If you haven’t heard of Hohem Tech then you might be missing out. It’s a new company that manufactures high quality gimbals and other related accessories. The HG5 Pro gimbal is the perfect example of a successful product made by Hohem, it’s high quality, packs a lot of features and has a very reasonable price. The HG5 Pro comes is a 3-axis gimbal with full 360 precision to give you a super smooth footage that allows you to shoot high quality videos in whatever activity you’re engaged, no shaky videos anymore! This gimbal is made of aluminium which means it weighs less so you’re arm doesn’t get tired while shooting videos. It has a 5-way joystick and multi-function button that helps you control and change modes easily. A built-in bluetooth feature is not something usually offered on gimbals, however the HG5 Pro comes with bluetooth and an app on Android and IOS used to control the gimbal. The Hohem HG5 Pro can also charge your camera while it’s attached which results in longer video shoots, that’s one more thing to worry less about! It’s compatible with GoPro Hero 3/4/5/6. This is yet another product from Zhiyun that is as good as the other one, if not better. The design is simple – there are three buttons on the handle that let you control the camera tilt and different modes. There are several rotation angles, and you can lock the camera along the three axes (pan, tilt and roll). The Zhiyun Z1 doesn’t compromise on battery performance, providing close to 10 hours of working time on a single charge. It supports BacPac and has a specially designed USB port to charge your GoPro, should the need arise. It does not dig too deep in the pockets, and can be considered value for money if you are looking for a professional gimbal that is as good as the EVO products but does not cost that much. Although the Feiyu G4 is an old model, it continues to be one of the best gimbals out there even in 2018. It is perfect for GoPro Hero 4, Hero 3 and Hero 3+ models, and works well with similar cameras from other companies as well. The design is sleek and uncomplicated, and the device is easy to use. In fact, Feiyu boasts itself of the single-button operation of this model. It comes with the heading follow me mode, the heading and pitch follow me mode, the lock mode and the inverted mode. The only downside is the battery which runs out of juice in around 4 hours with constant usage. Unless you travel a lot and frequently find yourself in places without a charging point, this issue should not be a deal-breaker if you end up narrowing down on the Feiyu G4. The Redfox 3 Axis gimbal is not a very popular product from Gizcam, but it has all the specifications that you may expect in the best gimbals in the market. It has a white aluminum finish that makes it sturdy without being too bulky. The design is simple and unique, and aesthetically appealing. The setup is hassle-free, and you can practically use it out of the box. It comes with a Bluetooth remote control that helps you control the stability from a distance. The battery life is good enough – it can deliver 12 hours of performance on a single charge. The Neewer NW-Z1 Rider 2 is a steady multi-function stabilizer for your GoPro cameras that is not only cheap, but also high on performance. It offers three modes – pan following only, pan and tilt following, and no pan or tilt. The tilt working angle ranges from -90 degrees to +180 degrees, and the roll working angle ranges from -45 degrees to +45 degrees. Interestingly, the Neewer NW-Z1 comes with its own extension rod; so you can achieve long distance shooting without any problem. The battery capacity is quite average at 900 mAh, but this is the best you are probably going to get at this price range anyway. If you own a GoPro or a DSLR that does not weigh more than 2.1 lbs, the Roxant Pro can be a quite reliable camera stabilizer for you. Thanks to its unique design, the gimbal appears to be extremely sturdy – a quality that helps it to deliver top end stabilization and performance without costing as much as professional gimbals. There are 3 separate counterweights for immaculate balance adjustments. If you are looking to shoot long footage that may otherwise tire your hand, the Roxant Pro’s comfortable grip made of ‘no slip grip’ material makes it a lucrative option to consider. It is one of the very few video camera stabilizers that emphasize on reducing fatigue when used for longer periods of time and offering smooth shake-free footage in an efficient manner. Moreover, the gimbal comes with a lifetime support and a number of free video training tutorials that help you unleash the full potential of this device. So even if you are a beginner at using GoPro, this stabilizer will help you learn the basics quickly and transform yourself into a professional in quick time. Investing in a GoPro gimbal can be a tricky affair. It is important to keep in mind the various criteria that your chosen product must satisfy before you buy it. In this article, I provided you with a well-researched list of the best GoPro gimbals and stabilizers for 2018 currently in the market along with the specs and main features on each. It is now up to you to take your requirements into account and decide on the gimbal that suits you the best. I ordered this stabilizer along with the Sofoto PRO Video Camera Stabilizer to compare them together. The Roxant was about $64 when i ordered and this one was $29 ( ~2.2x difference) When i got them, they looked pretty much same from outside (see pics). For the product itself, it seemed slightly better in its finish compared to Sofoto, I tried out the stabilizer looking at a youtube video and both were very easy to setup ( I am a beginner and this is my first stabilizer ).. I tried it out walking around in the home, going up and down the stairs and also running around … and the stabilizer did really good job. It was swerving a bit, but i guess thats something i need to learn and adapt too.. but there was no noticeable running/walking motion in the video itself. One small difference with Roxant was that Roxant had 3 different size weights, but Sofoto one had same size 3 weights. I ended up returning the Roxant, as there was nothing worth the 2.2x cost.